Hareidi IDF rabbi, Nachal Hareidi co-founder, threatens zero cooperation if government tries to force enlistment. 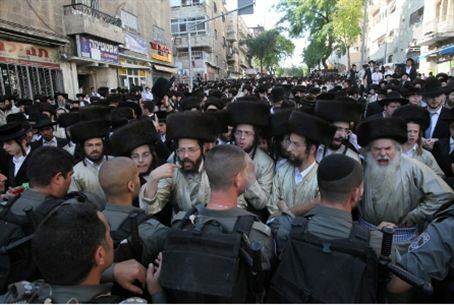 If the state tries to force hareidi-religious men to enlist in the IDF, hareidi men will stop enlisting even in the existing programs for hareidi soldiers, Rabbi Yoel Shwartz has warned. Rabbi Shwartz is one of the rabbis and co-founders of the Netzach Yehuda (Nachal Hareidi) Brigade, a brigade created for hareidi-religious soldiers. He spoke Sunday to Kol B’Rama radio, a hareidi station. “If this assault continues, will the rabbi end his involvement with Nachal Hareidi?” the interviewer asked, referring to the government-appointed Perry Committee plan to require hareidi men to enlist and consider their non-enlistment a criminal offense.. He suggested that enlistment stop already. “If parents were to ask me, I would tell them to wait for now, until it becomes clear whether the state wants to be a true partner to all of its citizens, or to compel its citizens using force,” he said. “If it wants to compel its citizens with force – we won’t be there,” he concluded.